With Europe engulfed in war, in the fall of 1915 the U.S. Navy’s General Board sat down to plan a huge build-up of the American battle fleet. A five-year plan, later shortened to three (funded in the 1917 through 1919 fiscal years), was to give the United States a fleet at least on par with that of Great Britain, one able to take on the winner of the European war on an equal footing. With Japan also seen as a looming threat, a major construction program was seen as vital to protect American interests. Don’t worry. Plan Gold has these, too: An early American battle cruiser concept. At the heart of the program lay six huge battleships of the South Dakota class, enormously larger than the preceding Colorado class authorized for the 1916 fiscal year. There would also be six very large but lightly-armored battle cruisers. And to scout for the battle fleet, 10 cruisers of what would become the Omaha class were ordered in the 1917 program. The bizarre forward armament of the Omaha-class USS Memphis. The General Board wanted a very fast cruiser, capable of over 30 knots, with very high endurance and an armament of at least six six-inch guns, all on a displacement of 8,000 tons. Reports from Europe indicated that even higher speed was essential for a scout cruiser, and so the speed requirement went to 35 knots (a figure shared with the “flush deck” destroyers of the 1916 program and the battle cruisers). The cruiser would also have to carry a floatplane. The Board demanded an emphasis on end-on fire, a concept abandoned by foreign navies a decade earlier. Scouts, the Americans believed, would rarely fight in line-ahead formation but instead would be advancing toward or fleeing from the enemy. 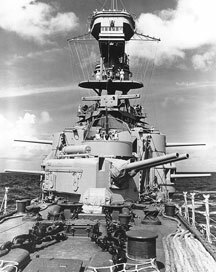 And so the designers adopted a very retrograde “citadel” arrangement, with a turret for two guns forward, and two pairs of six-inch guns mounted behind it in casemates, one pair over the other. An identical arrangement faced aft. Theoretically this gave the ship a forward- or aft-firing battery of six guns, but in practice American crews found the lower guns so wet in any sort of sea that they became unusable. Two of the cruisers were laid down in December 1918, and eight more during 1920. Even before riveting began, the General Board became dissatisfied with the design. Study of British cruisers during the American deployment with the Grand Fleet had exposed the end-on concept as outdated, and the design was already recognized as badly overweight. In October 1920, the Bureau of Construction and Repair (responsible for ship design) recommended halting the eight ships just begun and re-casting the design to eliminate the casemates and mount eight six-inch guns in twin turrets. Sensing that Congress might eliminate the ships altogether if their construction stopped, the General Board rejected the redesign proposal and ordered the ships to proceed as designed. From their perspective this was probably a wise choice — with the Great War over, funding problems halted the construction of several ships at times even without massive design changes. 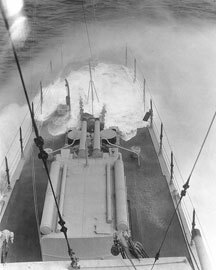 Why they were thought overloaded: USS Milwaukee takes water during a storm off Hong Kong, 1929. The Omaha derivative with four turrets was proposed, however, as the follow-on to the Omaha class. The Navy believed it needed large numbers of scout cruisers (they would not be known as “light cruisers” until 1930) to screen the battle fleet, lead detroyer flotillas, protect lines of communications and, of course, to scout. The Omaha derivative could be put into production quickly if approved, and its hull form (the Omahas were excellent seaboats) and high speed had pleased the Navy. But the General Board became obsessed with the British Hawkins class cruisers mounting 7.5-inch guns, even as the Royal Navy came to consider them a costly mistake and reverted to the 6-inch gun as their standard. The new American scout cruisers would have to carry 8-inch guns to overpower the Hawkins, and this would require greater size that the Omaha hull could not deliver. The new, larger cruiser with 8-inch guns became the Pensacola class; its specifications were those the American delegates proposed in the Washington Naval Limitations talks and would be the basis of the “Treaty Cruiser” type. Another Omaha variant was proposed very early in the design stages. The battle cruiser designs grew out of a requirement to back scouting forces with heavy firepower; where British battle cruisers were enlarged armored cruisers and German ones actually fast battleships, American battle cruisers would have been massively overgrown scout cruisers, with little to no armor. Most of the American “battle scout” proposals were large ships, growing in size over several years from 10,000-ton vessels with 6-inch guns through 25,000-ton ships with 10-inch guns (seen in U.S. Navy Plan Red) to 43,500-ton monsters with 16-inch guns. But in February 1916, the General Board requested a design for an Omaha (then still known as the “1917 Scout”) mounting two 14-inch guns in single turrets. The Bureau of Construction and Repair duly submitted a sketch, noted as Design 160. Proposals for cruiser-sized hulls with battleship-sized weapons would continue for the next two decades, but the Navy’s engineers rightly noted some severe problems with the approach. A battleship’s armored turret is mounted atop a heavy, armored barbette that sinks down into the bowels of the ship, structurally resting on the keel. While the armor protects the magazines and turntables, it also adds greatly to the ship’s structural integrity. The Omaha with heavy guns would lack this, and its lightly-built hull would be gravely stressed by the blast effect of firing its big guns. With only two barrels, the ship’s rate of fire would be abysmally low and it could easily be overwhelmed by an opponent armed with lighter but more faster-firing guns. Such a ship could be built, but the engineers considered it a bad idea and eventually the Board concurred. Design 160 was tabled. Game designers, of course, are not constrained by the same bounds of reality as the Navy’s General Board. U.S. Navy Plan Gold includes both of these cruiser alternatives. They’re listed with CS (scout cruiser) hull numbers, to avoid re-using numbers in the American cruiser numbering sequence, or assigning ridiculously high hull numbers. 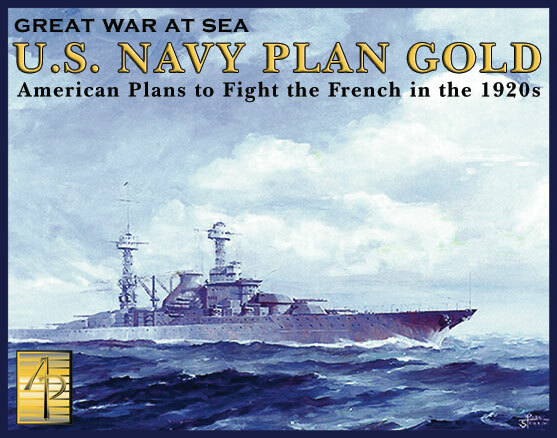 If you want to play with the Omaha alternatives, you can order Plan Gold here.